Speaker Paul Ryan, Rep. Bob Goodlatte (R-VA), and President Donald Trump are attempting a triple bait and switch con job effort to deceive Americans and fellow members of Congress into passing Amnesty bill HR 6136 today! This bait and switch trickery appears to be coordinated with the Trump White House after President Trump pulled a bait and switch on the American public by campaigning against DACA and Amnesty in 2016, only to endorse 24 hours ago both Amnesty bills up for a vote today. Rep. Dave Brat (R-VA) reported on Fox News that Trump told GOP lawmakers he will help protect them from backlash from his supporters who oppose Amnesty. Goodlatte and the White House negotiated with powerful DC-based anti-illegal immigration groups like NumbersUSA and Center for Immigration Studies (CIS) to craft the Goodlatte Amnesty compromise bill HR 4760. NumbersUSA and CIS have spent many months lobbying DC lawmakers to sponsor and support HR 4760 which would trade Amnesty for 700,000 DACA illegals for promises of future border enforcement and legal immigration reductions. Then at the last minute, Goodlatte has added his name to the new "Goodlatte Compromise Amnesty" bill HR 6136 which contains Amnesty for more than 1.8 Million illegal immigrants in order to confuse lawmakers and the public who think the Goodlatte sponsored bill is the one backed by NumbersUSA (HR 4760). Adding a second layer to this attempt at mass deception, Freedom Caucus Chairman Rep. Mark Meadows (R-NC) exploded on the House floor last night arguing with Speaker Ryan because the actual text of the bait and switch bill HR 6136 does not contain the provisions the Freedom Caucus agreed to in the bill! "We have a triple bait and switch in play in DC by the elites hoping to pass Amnesty legislation for millions of illegals today," declared William Gheen, President of ALIPAC. "Trump pulled a bait and switch on his top campaign issue of ending DACA. Then Goodlatte and Ryan pulled their first bait and switch setting up HR 6136 to pass instead of HR 4760. And now there is a third bait and switch where the text in Amnesty bill HR 6136 is not what Ryan promised the Freedom Caucus! None of that matters much because most of the lawmakers voting today have not read either bill." 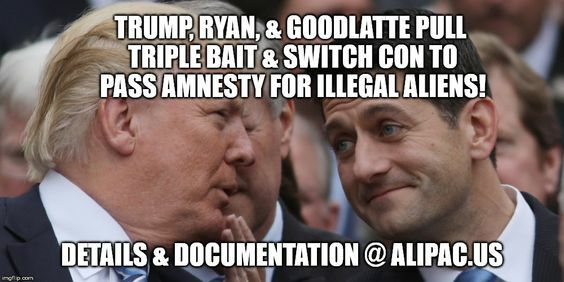 ALIPAC activists are rushing to warn other Americans and the alternative media about the layered bait and switch deceptions being deployed by GOP leadership Ryan, Trump, and Goodlatte to further the cause of millions of illegal aliens and their employers. After fracturing the anti-illegal immigration movement by supporting the Goodlatte Amnesty Bill HR 4760, NumbersUSA leaders Roy Beck and Van Esser sent out a desperate e-mail last night trying to generate opposition to the new bill HR 6136 (View), but it is uncertain if NumbersUSA can mount much of a defense after taking America to brink on Amnesty by walking into this bait and switch trap! ALIPAC tried to warn NumbersUSA that HR 4760 was a trap, but NumbersUSA did not listen, leaving ALIPAC as the only major illegal immigration fighting group to fully oppose "Amnesty deals" in Washington! Some pro-Trump publications like Breitbart News refused to report ALIPAC's concerns about Trump's support for Amnesty and Goodlatte's HR 4760 being a trap! Americans for Legal Immigration PAC activists, strategies, and messages have played a key role in defeating legislative Amnesty for illegal aliens more than 8 times since 2004. Last edited by ALIPAC; 06-21-2018 at 01:55 PM. Fifth Column Republicans work to grant amnesty and fool the American people. The article ought to be titled Fifth Column Republicans work to grant amnesty and fool the American people. And, all Fifth Column Republicans who support the bill should be listed to inform voters. There is no better way to weaken, destroy and subjugate a prosperous and freedom loving country than by importing the world’s poverty stricken populations into that country and making the country’s existing citizens tax-slaves to support the economic needs of such an invasion. Beezer and JohnK like this.